- AUD volatility ahead say CBA and RBC analysts. - CBA eyes near-term losses, forecasts 2019 recovery for AUD. The Australian Dollar is likely to be volatile in coming months, according to multiple analysts, although forecasts of where the currency will end this and next often read like a Dickensian Tale of Two Cities. Warnings of continued volatility in Australian exchange rates are based on expectations that global markets will remain under pressure due to fears of an escalation in the U.S. trade war with China, as well emerging concerns over a possible pause in the pace of Federal Reserve (Fed) interest rate rises. The divergence between various forecasts for where the Antipodean unit will be come year-end, as well as what 2019 has in store for it, are themselves based on predictions of just how far President Donald Trump will go in his tariff fight with China. Whether or not the Fed does eventually signal a policy u-turn also plays a significant role too. "Ultimately, we think the US and China applying tariffs on each other's exports will have little long term impact on the US, Chinese or Australian economies. But in the near term, AUD/USD could decline and test 0.7000 before recovering if the US-China trade frictions escalate," says Joseph Capurso, a currency strategist at Commonwealth Bank of Australia. Australia's Dollar has been badly bruised this year, initially by a deteriorating outlook for domestic interest rates and more recently, by the White House having gone toe-to-toe with China in a tariff fight over allegations of "unfair" trading practices that include the "forced transfer of intellectual property". U.S. officials have sought fresh talks with Chinese counterparts in order deescalate the conflict, although President Trump's own words last weekend show that this is likely just a precursor to the next, and largest to date, round of tariffs to be levied on Chinese exports to the US. The White House has announced the intention to impose tariffs on Chinese exports worth a total of $250 bn, although levies on $200 bn of this number are yet to actually be introduced. It is these latter tariffs that Trump now holds above the head of China like a Damocles Sword. And already the Chinese stock market is down by nearly 19% for 2018, a steeper fall than even that seen in crisis-hit Turkey. The Shanghai Composite Index had decline -18.9% for 2018 on Friday while Turkey's ISE National 100 was down -16.7%. This explains perfectly why Australia's Dollar has fallen close to 10% this year. Above: Chinese stock market, Turkish stock market (orange) and U.S. market (blue). "We think AUD is acting as an escape valve for pressure elsewhere, specifically in Asian EM. 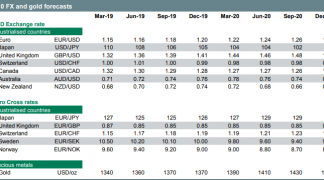 With many Asian currencies being heavily managed including CNY(H), movements in spot are not necessarily a good barometer of shifts in market sentiment or expectations," says Adam Cole, chief currency strategist at RBC Capital Markets. "The perception that the risk of a large move lower in CNY(H) is elevated seems more important in driving recent independent AUD weakness than a rather neutral domestic background." Cole says Chinese economic data will soon start to reflect the "pro-growth" policy measures taken by the government this year and that this should soon ease the pressure on the nation's currency. This is expected to throw the Australian Dollar a lifeline, so Cole is minded to use "recent AUD weakness to play the topside". 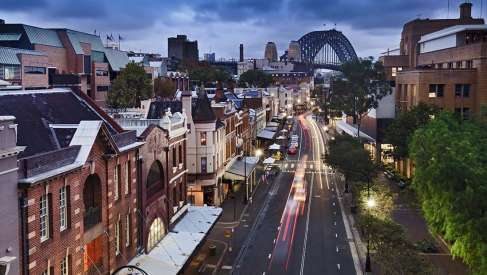 However, despite eyeing an opportunity to bet on an Aussie recovery over the short term, the RBC team are forecasting that the currency will remain at depressed levels until at least the end of 2019. "The US-China trade frictions are taking a toll on AUD/USD both directly, and indirectly via a hit to commodity prices. The US-China trade frictions will likely escalate further before being resolved, guiding AUD/USD lower," warns Capurso. Capurso and the Commonwealth currency desk have an almost the opposite view to that of the RBC team. They are warning about the possibility of the Australian Dollar suffering more losses in the short term, but are forecasting a steady recovery for the currency once into 2019. "We think there is a risk the FOMC could signal a pause to its rate hike cycle before the end of the year," says Capurso. "A pause in the FOMC's rate hike cycle will push the USD down by 3-5% and therefore push the AUD/USD up by at least a similar magnitude." Capurso forecasts the AUD/USD rate will finish 2018 trading around 0.72, which is exactly where the exchange rate was on Friday, but they have a steady climb all the way up to 0.75 pencilled in for next year. 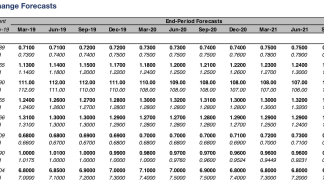 Conversely, Cole and the RBC team project the AUD/USD rate will fall back to 0.70 before year-end and that it will mostly remain close to that threshold until at least the end of 2019. RBC are looking to see the Pound-to-Australian-Dollar rate decline by nearly 5%, from 1.81 to 1.71 before year-end, before rising to only 1.72 in 2019. Commonwealth on the other hand, are looking for a more gradual decline to 1.75 by the end of this year and 1.71 over the course of 2019. 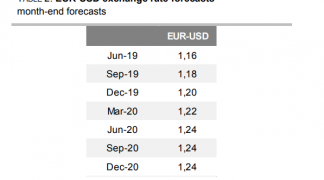 Both sets of Pound-to-Aussie forecasts are influenced significantly by the analysts' expectations of the Brexit negotiations and the anticipated outcome's likely impact on Pound Sterling. The AUD/USD rate was quoted 0.30% higher at 0.7208 Friday while the Pound-to-Australian-Dollar rate was 0.18% lower at 1.8208.